This November, the world’s number one bourbon is set to bring the magic of its famous Jim Beam distillery to the heart of London. On 21 and 22 November 2013, Jim Beam will transport bourbon-loving Londoners over the rolling hills of Kentucky and into the world-class Jim Beam Stillhouse which will stand, for two nights only, in The Old Truman Brewery on Brick Lane, London. 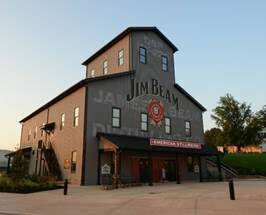 Offering a twist on the American institution, the Jim Beam Stillhouse will provide guests with an attack on the senses through an authentic distillery experience, as well as the opportunity to become part of Jim Beam’s history. Upon entry, guests will be welcomed into The Heritage Room where they will soak up the Kentucky scenery on the Stillhouse veranda, whilst hearing the story of Jim Beam. Visitors will then travel through tunnels deep into the Stillhouse for an intriguing glimpse into the Distillation and Ageing Room, bringing them closer to the bourbon-making process. Immersive theatre will bring to life the unique proprietary process used to create Jim Beam’s most intense member of the family, Devil’s Cut, whilst guests revel in a taste of the extraordinary new bourbon. A flavour explosion awaits in The Mixology Room where bartenders will serve up a playful cocktail experience. Here guests can enjoy the infused flavours of Red Stag by Jim Beam and Jim Beam Honey. Tickets for this inimitable distillery experience in London are sure to be snapped up quickly, so get them while you can and, in the words of seventh generation Master Distiller, Fred Noe, you’ll 'come as a friend and leave as family'.